As I readjusted the bike helmet that had been ripped to side of my face, it took me a moment to realize that I’d been punched in the head. My immediate surprise (punched, on my bike?) turned to rage (yelling profanities), which quickly turned to fear (will he chase me down? ), and then back to rage (more profanities) once I realized the culprit was speeding away in the opposite direction. I am, admittedly, an aggressive city cyclist, bobbing and weaving through traffic and over the Williamsburg Bridge every morning. My commute usually feels robotic – I know the speed to take at each turn, the timing of the traffic lights. That morning, a cyclist coming from the other direction didn’t like that I tried to pass a slower rider at the onramp to the bridge, causing the three of us to momentarily share a two lane bike lane. I was laughing by the time I reached the apex of the bridge. New York City, man. I thought I’d seen it all. But riding North toward my office in the Village, I pondered the complexity of my emotional response – anger, fear, anger, amusement – that unfolded over no more than a few seconds. Would everyone’s mental temperature follow the same arc? Would mine, if I’d had a little less coffee or a lot more sleep? Emotions color our lives – but how do our lives shape our emotions? Simple as it may seem, this question animates a long-running argument at the intersection between psychology and neuroscience. Like many modern scientific theories of biological phenomena, theories of emotion date back to Charles Darwin, who published The Expression of the Emotions in Man and Animals in 1872. Darwin argued that emotions, like physical characteristics, are evolutionarily inherited across species and therefore must have a consistent, measurable fingerprint. Generations of scientists searched for these physical signatures in an attempt to understand how emotions arise in the mind, how they affect the body, and how they influence decision-making. They measured facial expression or heart rate, pupil dilation or skin conductance, to name a few. Most of these studies rely on the assumption that humans are subject to a well-defined range of emotions localized in specific parts of the brain. Blending approachable scientific explanations with personal vignettes, Barrett presents an argument that many readers may understand intuitively. 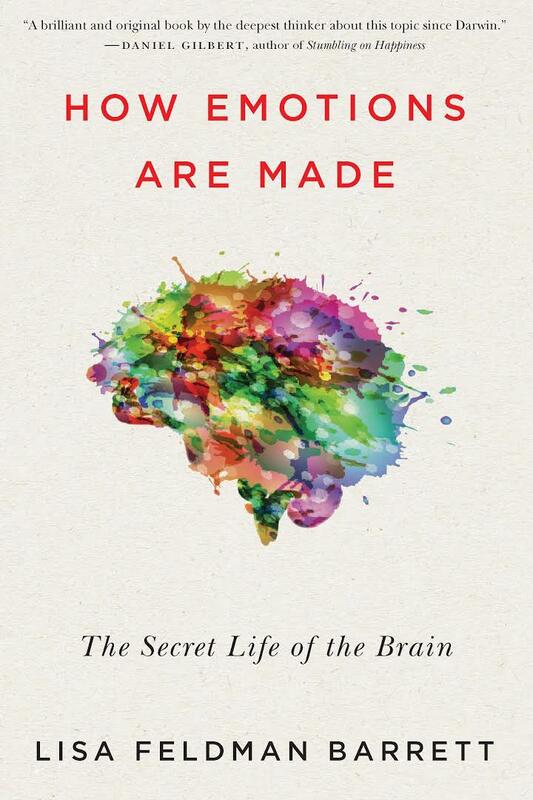 Every person is born with a brain designed (by evolution) to make guesses about how the world works. As children, we learn the rules of emotion through repetition: tears can mean happiness but most of the time mean sadness. The word “angry” probably means we have done something wrong. But we cannot measure emotion, Barrett argues. And we cannot localize fear, anxiety, or joy to a specific region of the brain. Emotion is different in all of us: our childhoods, our culture, even our vocabularies change how our brains create our emotional reality. Barrett’s grand hypothesis is compelling, and argued with such conviction, that the reader might not realize how novel it is – or that it is, in fact, enormously controversial. The debate between Universal Emotion and Barrett’s theory, which defines emotions as individualized and experience-dependent, represents a long-running clash between neuroscience and psychology, largely fueled by the advent of functional MRI. With this new tool, scientists can measure blood flow in the brain as a proxy for neural activity. This allows them to understand neural function more directly, instead of relying on external measures like facial microexpressions or sweaty palms. If you ask me how I feel about the comically grave chain mail my mother sent me about poisonous bananas, I might chuckle and say “amused,” blush and say “embarrassed,” or simply blurt, “is this about pesticides again?” Ask me again while my head is encased in an MRI machine that projects my neural patterns onto a computer screen, and you’ll now see a cascade of activity across all regions of the brain, representing memories of my mom, the color of bananas, and the message sent to my facial muscles causing me to roll my eyes. The conscious experience of human emotion is a simplified and categorical version of the chaotic and deeply complex neural computations that, until recently, have been impossible to measure. When Barrett uses these new techniques, she uncovers not universality, but individualized and diverse brain activity that contributes to our emotional states. The writing in How Emotions Are Made reflects the complexity of the current state of brain science: there is a lot of terminology to keep track of. Our brains become hardwired to make predictions, or “simulations” – the brain’s best guess for how to interpret a stimulus like a loud bang in a public place. Context matters: is it the 4th of July? Barrett groups simulations together into culturally derived “concepts” that help codify sensory information – linking, for instance, fireworks to the celebratory idea of a holiday. “Interoception” is the brain’s ability to translate these simulations into a general mood, associating a jovial feeling from previous Independence Days to the experience of standing under a shower of colorful explosions. For the most part, Barrett successfully translates the complexity of her neuroscience research into language understandable to a general audience. At times, though, the reader may get of tired wading through nuanced explanations of a centuries-old scientific dispute. Barrett has faced a lot of criticism for her ideas, and it is understandable and important that she build a strong technical foundation for her argument. In a book for lay audiences like this one, she gets the most mileage out of relatable examples connecting her theory to everyday life. About halfway through the book, Barrett lets down her academic guard and has some fun. The reader is rewarded with fascinating ruminations on the role of emotion in our modern culture. Our emotions depend on prior experience, and can change if we alter our vantage point. “When you feel bad, treat yourself like you have a virus rather than assuming that your unpleasant feelings mean something personal,” she writes. “Your feelings might just be noise. You might just need some sleep.” Barrett urges readers to distance themselves from their emotions, to understand that anger and sadness are complex responses induced not just by their interaction with the world around them, but also by the basic physiology of their bodies, like how hungry they are. In a chapter entitled “Mastering Your Emotions,” Barrett breaks down the barrier between mind and body. She explains that you can evaluate strong emotions as physical sensations “rather than letting those sensations be a filter through which you view the world.” In other words, you can dissociate the physical manifestation of tightness in your chest and increased heart rate from the emotional feeling we equate with anxiety. By addressing the former, might you change the latter? Her ideas parallel psychology’s Mindfulness Meditation approach. Rooted in Buddhist tradition, Mindfulness Meditation involves focusing one’s attention on breathing to disentangle thoughts from physical sensation, thereby easing stress and anxiety. Barrett’s astute neuroscientific rationale for this popular panacea was refreshing. At times, though, she can’t resist playing therapist, admonishing us to eat well, get enough sleep, and increase emotional intelligence by becoming a “collector of new experiences.” She even suggests that the reader listen “to thought-provoking audio content like National Public Radio.” Despite these assertions, How Emotions Are Made is certainly not a self-help book. But it does challenge the reader to rethink the relationship they have with their emotions, and how this relationship impacts their interaction with the world around them. After all, the human brain does not wire itself for emotion in isolation. Barrett makes a strong case that her Theory of Constructed Emotion applies to broader cultural issues like discrimination in the American legal system and mental illness. What happens when our emotional predictions are used to judge others, or when the brain’s simulations go pathologically wrong? “Affective realism,” the phenomenon where people determine supposed facts about the world based in part on their feelings, can lead to dangerous situations. A police officer who feels that they are in danger may mistake a cell phone or a bag of skittles for a gun, leading them to fire their weapon. “Many factors may contribute to these tragedies, ranging from carelessness to racial bias, but it is also possible that some of the shooters actually perceive a weapon when none is present due to affective realism in a high-pressure and dangerous context.” Barrett tries to distance herself from making a political statement about the nature of these shootings, and certainly does not intend to absolve officers who have fired at an unarmed individual. This acknowledgement, however, that implicit biases and emotional state change the reality our brains create is truly profound. What can we do with this information? Can we actively train ourselves to be less racially biased, and thereby change our behavior? Barrett also speculates on how the brain’s construction of emotion can become pathological. Depression may result from a failure to update neural predictions (you’re stuck in the past and can’t adapt), while anxiety comes from too many unreliable predictions (you never know what’s around the next corner). Those with autism may not be able to form concepts, and therefore struggle to categorize and generalize sensory information. The implications of the research are still being worked out, but the book’s cultural implications are clear. Modern technology puts a world of information and social networks in our pocket, but adds a dangerous, emotionally fraught sense of urgency to every ping or notification. Ubiquitous advertising pushes specific emotional buttons to influence our decisions. Politicians and the news media focus on emotional stories, distracting from actual policy. Aaron Katzman studies how genes and molecules form emotional memories as a graduate student in Neuroscience at New York University.